Clearly the Stonehenge tunnel scheme will not protect the World Heritage Site. “We are facing nothing less than a crisis in our democracy — based on the systematic manipulation of data to support the relentless targeting of citizens, without their consent, by campaigns of disinformation and messages of hate”. 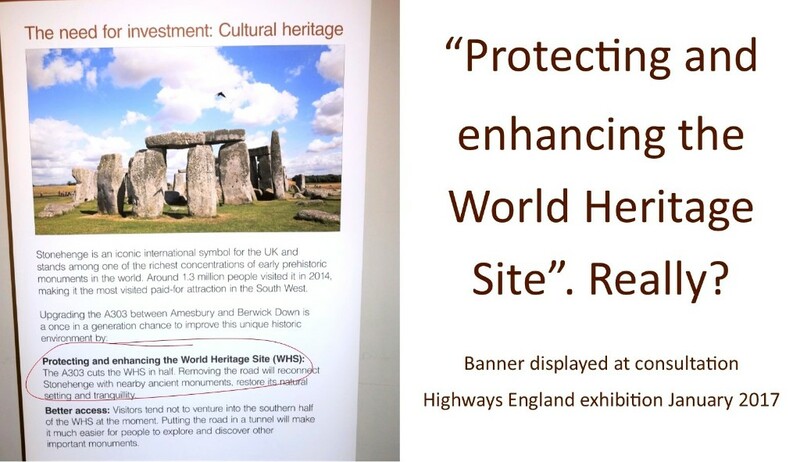 The bodies issuing such statements have no intention of ensuring “the right solution for the WHS” so long as Government is driving a project based on “affordability, deliverability and value for money.” Joint UNESCO World Heritage Centre and International Council on Monuments and Sites advisory missions have given firm advice to the Government to seek less damaging alternatives for the major road scheme through Stonehenge World Heritage Site. Clearly, “engaging with international heritage advisors” doesn’t extend to Government following their advice. In March 2018, we submitted a written statement to the Select Committee with instances of fake news about the A303 scheme, most notably Highways England’s claimed commitment to preserving the World Heritage Site. Since then, misinformation continues widely to distort public perceptions about what the A303 scheme involves. Highways England’s website information, under “Why we need this scheme”, highlights the project as “protecting or enhancing the environment” and helping to “conserve and sustain the World Heritage Site”. Misleading the public about so-called benefits of the A303 Stonehenge scheme, particularly in association with official consultations on the project, is both outrageous and repugnant. How much longer will Government support the undemocratic targeting of citizens with misinformation about the A303 proposals? We look forward to the Select Committee’s final report expected later this year. Supplementary consultation ends 14 August! A supplementary consultation on the A303 Stonehenge scheme is currently under way, closing at midnight on 14 August. To have your say please link here.